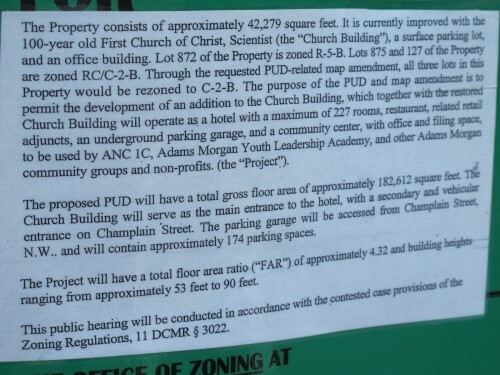 On July 29, 2011, the Office of Zoning received an application from Adams Morgan Church Hotel, LLC, on behalf of First Church of Christ, Scientist, Washington, D.C., and Glancer Properties, LLC, the owners of the subject property (collectively, the “Applicant”). The Applicant is requesting approval of a consolidated planned unit development (“PUD”) and related map amendment for the property located at 1770 Euclid Street, N.W. (Lots 872 and 875 in Square 2560) and 2390 Champlain Street, N.W. (Lot 127 in Square 2560) (the “Property”). The Office of Planning provided its report to the Zoning Commission, dated November 4, 2011, and the case was set down for hearing by the Commission on November 14, 2011. The Applicant provided its prehearing statement to the Commission on April 30, 2012. The Property consists of approximately 42,279 square feet. 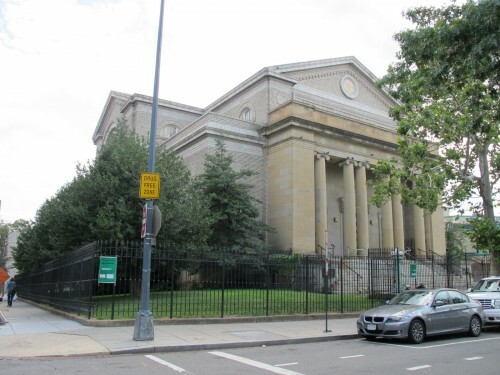 It is currently improved with the 100-year old First Church of Christ, Scientist (the “Church Building”), a surface parking lot, and an office building. Lot 872 of the Property is zoned R-5-B. Lots 875 and 127 of the Property are zoned RC/C-2-B. Through the requested PUD-related map amendment, all three lots in this Property would be rezoned to C-2-B. 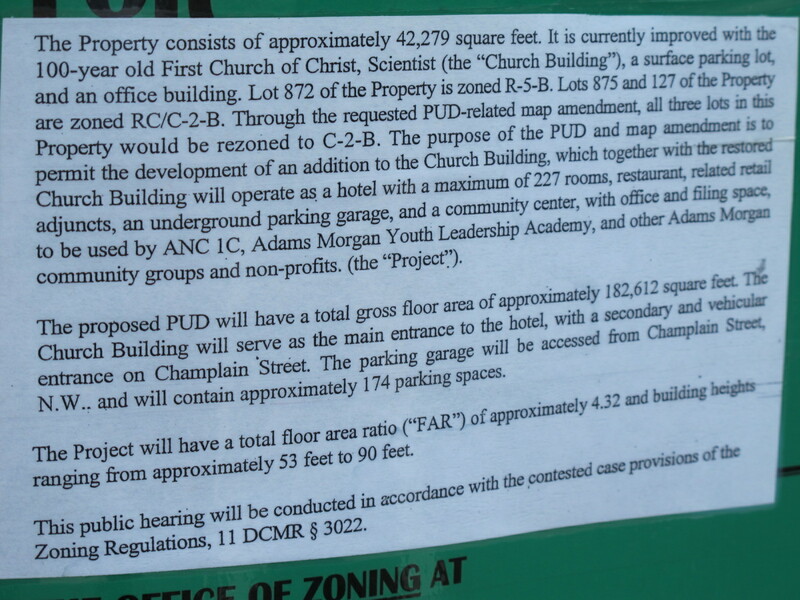 The purpose of the PUD and map amendment is to permit the development of an addition to the Church Building, which together with the restored Church Building will operate as a hotel with a maximum of 227 rooms, restaurant, related retail adjuncts, an underground parking garage, and a community center, with office and filing space, to be used by ANC 1C, Adams Morgan Youth Leadership Academy, and other Adams Morgan community groups and non-profits. (the “Project”). The proposed PUD will have a total gross floor area of approximately 182,612 square feet. The Church Building will serve as the main entrance to the hotel, with a secondary and vehicular entrance on Champlain Street. The parking garage will be accessed from Champlain Street, N.W., and will contain approximately 174 parking spaces. The Project will have a total floor area ratio (“FAR”) of approximately 4.32 and building heights ranging from approximately 53 feet to 90 feet. This public hearing will be conducted in accordance with the contested case provisions of the Zoning Regulations, 11 DCMR § 3022.